"The BEST pork barbeque recipe available. 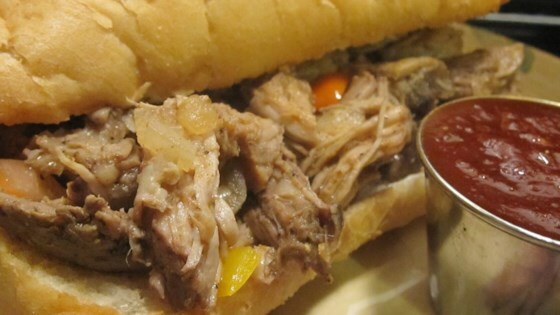 It is a modified version of a long time secret pork barbeque recipe of a now out of business barbeque restaurant in Harrisburg, Pennsylvania. It can be made the day that it is to be served, but the best is to cook it the day before, place it in the refrigerator overnight, and then heat it in the slow cooker the next day to serve. This way, it soaks up all of the added flavoring." In a bowl, mix the wine, white pepper, liquid smoke, garlic, black pepper, pepper sauce, and Worcestershire sauce. Place pork in a slow cooker, and cover with the sauce mixture. Cover, and cook 4 to 5 hours on Low, or until the meat shreds easily. Shred the pork with a fork. Mix in the barbeque sauce, onion, green bell pepper, red bell pepper, and yellow bell pepper. Continue cooking 30 minutes, or until vegetables are tender. Place pork in a strainer to remove excess liquid, pushing down with a large spoon to extract as much moisture as possible. Liquid may be reserved as a dipping sauce. Well, this is NOT the best barbeque I've had..Pork was tasty and tender, but the sauce was just not a favorite with me. I appreciate the post, however. Salvaged it by dumping a bottle of bbq sauce in it.